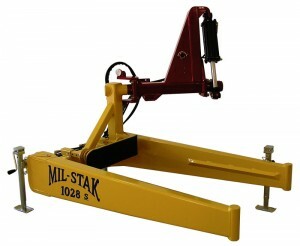 The Mil-Stak bale loader clamp comes in three different models to accommodate either 3×3 bales, 3×4 bales, or an adjustable model that handles both. Our simple, reliable design fits any size of operation from the family farm to the large commercial operator. Each clamp comes with a complete mounting kit which includes everything you need to start loading and stacking big bales with your New Holland® self propelled bale wagon. The model 1028-s is designed with a solid, non-adjustable frame to fit 3×3 bales and includes a two spring cushion bumper. 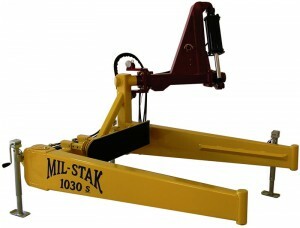 The model 1030-s is designed with a solid, nonadjustable frame to fit 3×4 bales and includes a three spring cushion bumper. 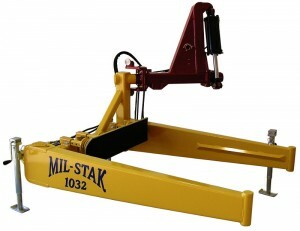 The model 1032 is designed with an adjustable frame, allowing it to handle 3×3 and 3×4 bales. It comes with a two spring and a three spring cushion bumper. By removing four bolts and two pins the clamp can be switched between 3×3 and 3×4 bale sizes in less than fifteen minutes. 2019 © Copyright - Mil-Stak, Inc.